The market is segmented by Type (Radio, Satellite), Application (Aerospace, Defense), and Geography. The aerospace and defense telemetry market is expected to register a CAGR of 4.72% during the forecast period, 2019-2024, to reach a market value of USD 17.29 billion by 2024. Growing usage of telemetry in military applications, like intercepted telemetry in guided missiles, land systems, armored vehicles, aircraft, marine ships, and UAVs is expected to augment the demand for telemetry during the forecast period. Additionally, increase in defense spending due to various security threats imposed both externally and internally, increasing terrorist threats, the increasing interest of some nations toward world dominance, several border security issues, and volatile relations among nations are factors expected to support the growth of the concerned market. Telemetry is the measurement and wireless data transmission of data from remote sources. Sensors measure physical data or electrical data that are converted into specific electrical voltages. Multiplexers combine these voltages with timing data into a single data stream for transmission to a remote receiver. At the reception, the data stream is separated into its original components and the data is displayed and processed according to user specifications. In this report, the telemetry system used in the aerospace and defense sector has been studied. The report covers the various market dynamics on a regional and country basis. Aeronautical telemetry is used in military and commercial applications, like space exploration, rocketry, and flight testing, to enable real-time monitoring of environmental conditions in flying objects. Satellite telemetry is crucial for commercial as well as military flight test missions. These systems help in monitoring the data, which has been collected from onboard instrumentation over an RF link. Real-time data, as well as analysis of the data, has been proved to be crucial for the safety of the test pilots, and this requires a reliable high throughput link. Satellite communication is expected to witness a significant increase, primarily due to the growth in the usage of smart weapons as well as unmanned aerial vehicles. Also, missions, such as the launch of 104 satellites inside a single rocket by ISRO (India), will likely boost the satellite telemetry market's growth during the forecast period. 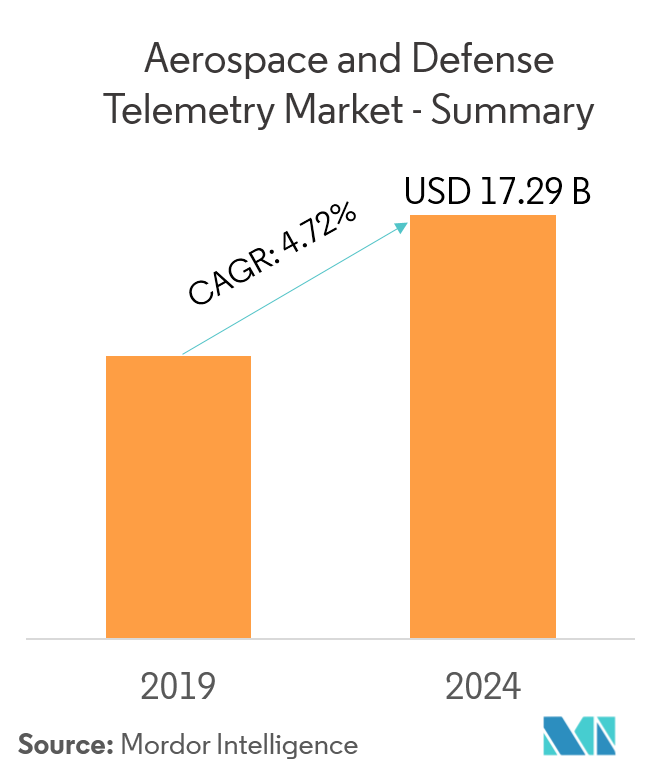 Currently, North America dominates the aerospace and defense telemetry market, primarily due to high investment in the military and space sectors. 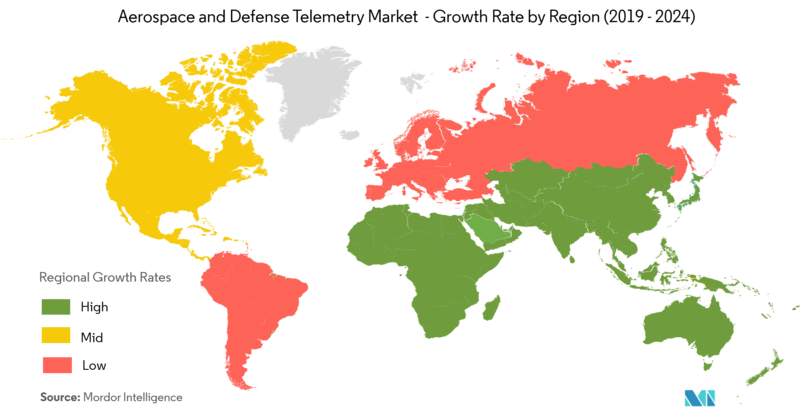 However, the growth of Middle East & Africa and Asia-Pacific is expected to be higher during the forecast period. Political tensions between Gulf countries have forced them to increase their defense spending for equipment modernization. Saudi Arabia, Israel, the United Arab Emirates, and Qatar are revamping their commercial as well as military aviation sector. Demand for unmanned aerial vehicles is also high in the region. Such developments will likely generate demand for telemetry system in the region. Emerging economies in Asia-Pacific, like India, China, and Japan are investing huge amounts in modernizing their armed forces. The modernization programs are further boosted by the increasing defense spending from these countries, which collectively, has a positive impact on the growth of the market. 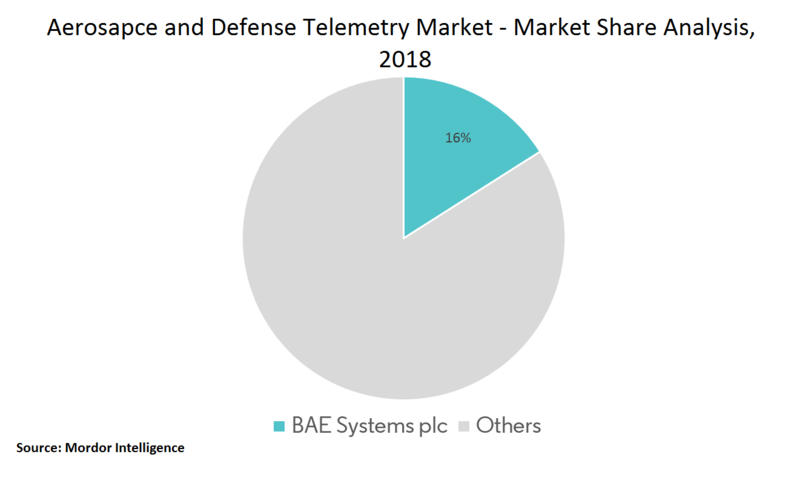 The aerospace and defense telemetry market is fragmented, with the top five manufacturers occupying more than 50% of the market share in 2018. The application of telemetry is vast, and its use in the field of navigation, communication, military intelligence, rocketry, space science, and flight testing is propelling its demand in the global market. As the players compete to receive contracts, the level of competition is intense. In July 2018, BAE Systems and Goonhilly Earth Station (GES) signed a memorandum of understanding to supply two Tracking, Telemetry, and Command Processor (TTCP) systems to GES. The technology will allow GES to communicate and track a wide range of spacecraft, including future manned and robotic missions to the Moon and Mars. 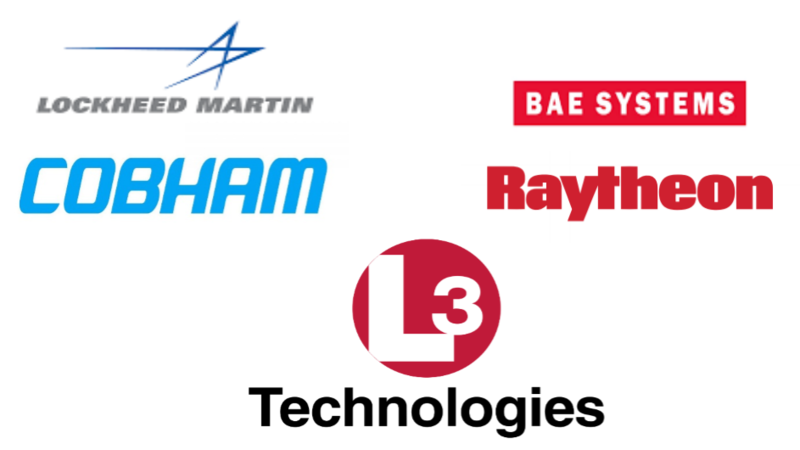 BAE Systems, L3 Technologies, Lockheed Martin Corporation, and Cobham Plc dominate the market.